Services - Find out what Adair’s Demolition Can Do for You! Adair’s Demolition team is committed, qualified and trained, with many years in the field. We are stepping up our efforts to reduce our environmental footprint. We strive to be leaders in high quality demolition and environmental services. Our company is equipped with the proper tools to get each job done professionally and efficiently every time. Concrete crunchers, steel shears, etc. Adair's Demolition & Excavation . has demolished over 1,800 grain elevators for Sask Wheat Pool, Viterra, Parish & Heimbecker, and Paterson Grain. This experience has finely tuned our skills to demolish all other types of big buildings such as apartment complexes, theaters, churches, and schools. 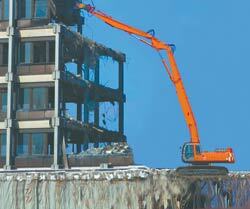 We are well-versed in providing safe, successful demolition to any structure of any size. Our complete line-up of heavy equipment makes excavating any site a breeze. Our contractors are skilled to work in both tight spaces and expansive areas, such as residential plots or commercial business environments. Over the past few years we have recognized the imminent need for hazardous materials abatement prior to most demolitions. Adair's Demolition Ltd. offers abatement services for both residential and commercial settings to eliminate all types of hazardous materials prior to any demolition. Whether your project is a small job or a large contract, we have the ability to work through the life cycle of the project. Our experienced project manager stays in constant communication to monitor a project and to provide the most economical solution to every job. Adair’s Demolition is your 1 stop shop for all of your demolition, excavation and hazardous materials needs.